Hello friends! I hope you are ready for a great weekend! Today I have a card to share that I made using one of the ODBD 5th Anniversary sets, Scripture Collection 11. I also used Dahlia and Vine Background. I used the Sketch from Tuesday Morning Sketches this week and Stampin Royalty. Just briefly, I stamped the vine background on white card stock with Colorbox Khaki Green ink and cut my strips according to the sketch. I stamped the Dahlia flower with Memento Angel Pink on my background and also on a panel for the sentiment. I then overstamped my verse with black and cut with SB Marvelous Squares. The kind of fun thing I did with this card was to play around with the ODBD Custom Antique Labels & Border die, specifically the border die, and made my rose with it. While I'm reasonable happy with how it came out, I have some work to do before I can do a tutorial for you, as this one was a bit fussy and definitely not the easiest rose to make. It was however a lot of fun! I did an end to end double cut of the die, sponged both sides lightly with Angel Pink ink, spritzed with water, crumpled up to break some of the fibers to make it more pliable, and then rolled it around my piercer, pinching it up as needed to place the petals where I wanted them. I did add some glue as I went to hold it whenever I had to pinch in a part of a petal. If I get it down to a more precise science I will do a tutorial for you, but for now, I have a bit of work to do before I feel like I can explain it. LOL! I hope you have a blessed weekend!!! 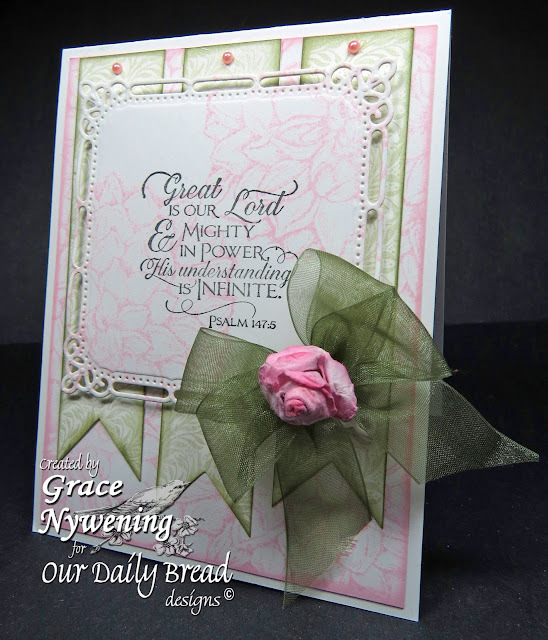 Beautiful, love the layout, pretty colors and stamping, love your idea with the flower!! What a beautiful card with so much stamping. Love the way you have made the rose - it looks stunning, albeit fiddly to make :-). Gorgeous card!! Lovely BG paper you made! 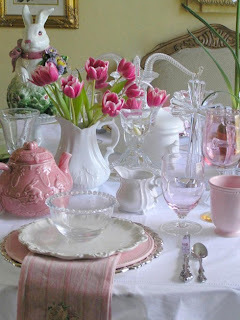 I love the green/pink combo and that rose!! wow Grace, this is just stunning. I love how you stamped this flower in the soft pick. I literally sucked in my breath! This is STUNNING!! My daughter saw it and her jaw dropped. Lovely. Thanks for joining us at Tuesday Morning Sketches. What a gorgeous table scape and a fabulous cars! Thanks for a beautiful example of using stamps as backgrounds. Love the flower! What fun!